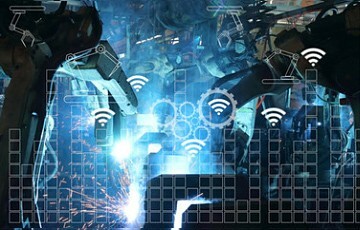 According to a new research report from the M2M/IoT analyst firm Berg Insight, annual shipments of wireless devices for industrial automation applications reached 4.6 million units worldwide in 2018, accounting for approximately 6 percent of all new connected nodes. Growing at a compound annual growth rate (CAGR) of 16.3 percent, annual shipments are expected to reach 9.9 million in 2023. 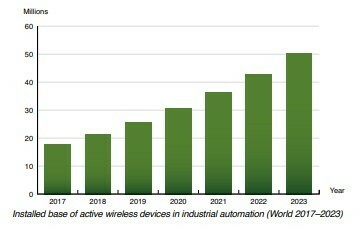 The installed base of wireless IoT devices in industrial automation reached at the same time 21.3 million in 2018. While wired networking solutions are still predominantly used for industrial communications between sensors, controllers and systems, wireless solutions have gained a strong foothold in a number of applications. Wireless solutions are used for wire replacement in parts of the plant that are hard to reach or uneconomical to connect through wired installations. In factory automation, wireless solutions are widely used to control cranes and automated guided vehicles (AGVs) in material handling applications. In process automation, wireless technologies are increasingly used to connect instruments, enabling plant operators to monitor and optimise processes in hazardous areas, while also ensuring worker safety. Major providers of wired industrial network equipment also offer wireless solutions to enable customers to monitor and control devices wirelessly in parts of the plant that are normally not connected to the control room due to accessibility or wiring costs. These include Siemens, Cisco, Belden, Moxa and Phoenix Contact, which all offer comprehensive portfolios of industrial wireless devices such as routers, gateways and wireless access points along their wired solutions. Industrial wireless solutions are also offered by many mid and small-sized companies, which often specialise in specific product categories. Examples include Acksys, Advantech, Beijer Electronics Group, FreeWave Technologies, GE’s industrial communications group GE MDS, HMS Networks, Red Lion Controls and Sierra Wireless. Wireless I/O and field devices are provided by many major industrial automation vendors including Emerson, Yokogawa, Honeywell, ABB, Schneider Electric, Siemens, Endress+Hauser and Pepperl+Fuchs. He adds that installation and maintenance of wireless solutions are more flexible and economical compared to wired technologies, enabling reconfigurable manufacturing system design. Although reliability and security remain a challenge, Wi-Fi has emerged as the most widely used wireless technology in industrial environments largely due to the wide availability of compatible hardware. There is also a growing trend among large industrial companies to deploy private 4G LTE networks instead of using Wi-Fi and even wired solutions. “The introduction of 5G cellular technologies broadens the addressable market for wireless communications even further as it allows for deployments in situations where requirements related to bandwidth, latency and capacity cannot be fulfilled today”, concluded Mr. Stålbrand.